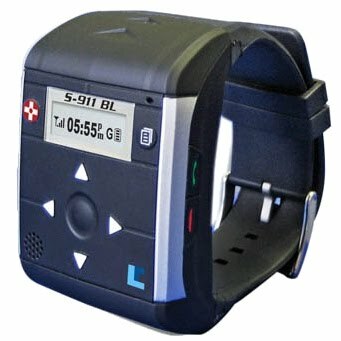 S911 Bracelet Locator was a long wait and finally we are happy to announce its immediate availability on GpsConnect.ca. Currently we offer a special reduced price for a limited period of time. For those who are not familiar, S911 Bracelet Locator is a revolutionary compact wrist-worn GPS tracking device with an emergency cell phone capabilities. It features a high-sensitivity GPS receiver that accurately calculates its geographic location using a constellation of Global Positioning System satellites and sends its location to a Gps Connect's data center using cellular GSM network where it becomes available for users via a web-based location tracking portal. In addition to standard features described above the Bracelet also equipped with an accelerometer sensor that is able to detect a fall or an impact and also can be equipped with a secure locking wrist band that prevents removing or accidentally losing the Bracelet from a wearer's wrist. One very important feature is an IP67 water-proof protection that comes standard with all Bracelet versions. Paired with a Gps Connect's web-based location tracking service the Bracelet turns into a very sophisticated and powerful yet affordable personal security solution for those in need. Do not hesitate to contact Gps Connect if you are interested in this solution or may have any questions. S911 Bracelet Locator comes with two different type of wrist bands: one is regular and another one is secured with additional locking mechanism that makes removing it from the wrist more difficult. In addition the secure wrist band is monitored for unauthorized removal or tampering. If such an event is detected the device will send an alert to the server.